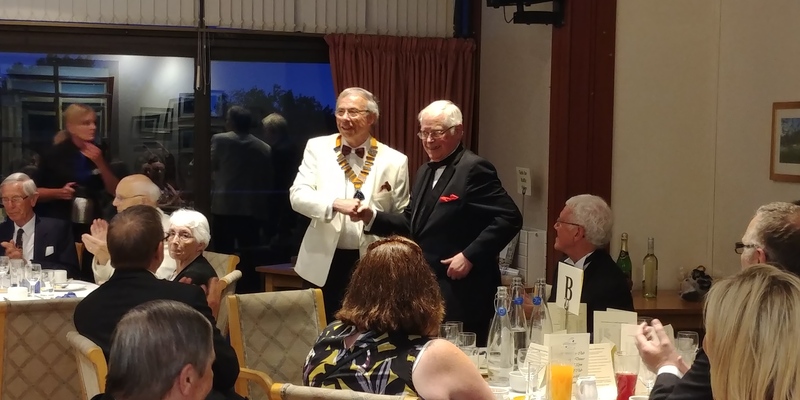 On Friday 1st June Club Members, past members and guests gathered at Cardiff Golf Club, Cyncoed, to celebrate 50 years of Cardiff Speakers Club! It was a great occasion and a chance to catch up with old friends. Members from at least 4 other clubs, joined us for this special event. As well as the dinner, there was the handover of the ASC’s South West England & South Wales Presidency from Phil McCaffrey to Graeme Milnes. The proceeds from the auction were to support the Cardiff Deaf Centre. The guests were addressed by their President, Edward Jenkins who gave an example of how difficult it is to hear if you have an impediment. 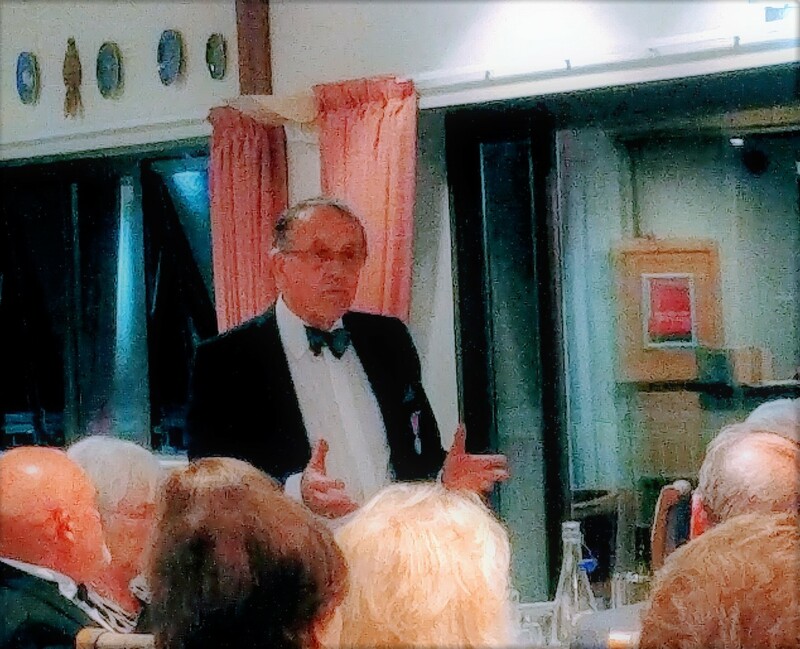 The Toast to the Guests was given by Club Member Rob Parsons who highlighted how some of the members tackle speeches and topics in their own unique way. But our special guest, who responded to the toast on behalf of the guests, was the ASC National President, Jackie Mafi. Her gift of a local Wigan specialty of Uncle Joe’s mint balls were much appreciated! 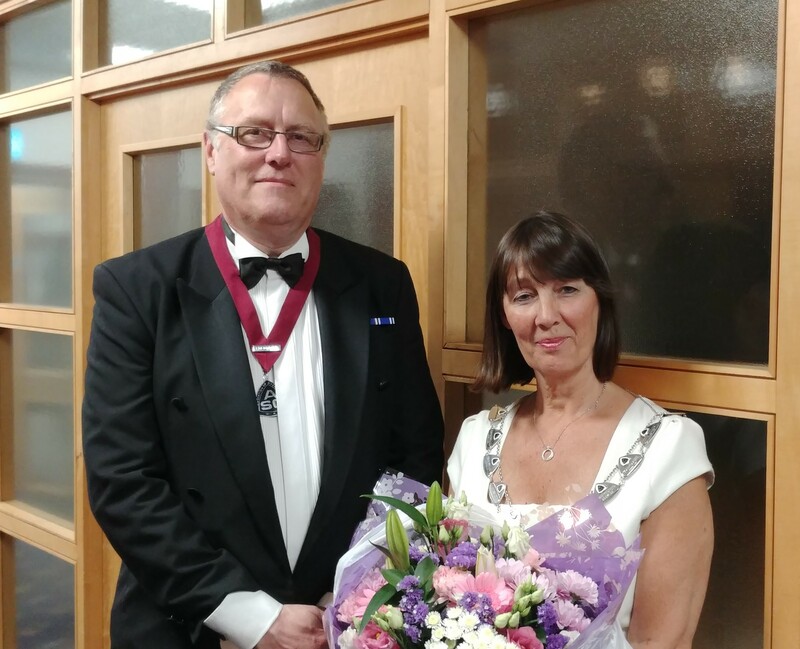 And Club President David Palmer was pleased to present Jackie with flowers to thank her for her speech and joining us at our Anniversary Dinner. 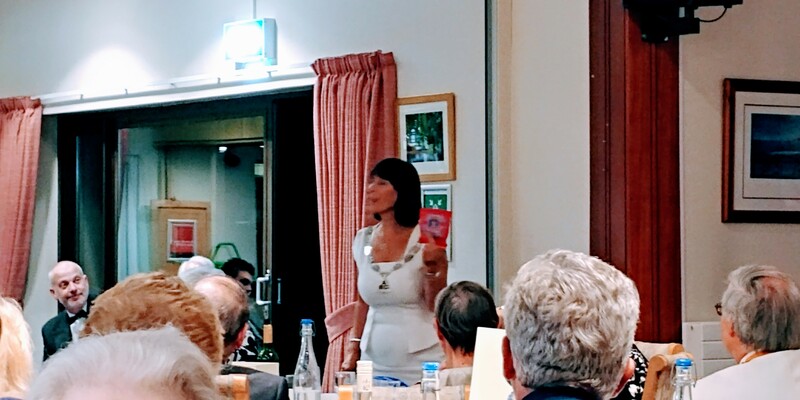 A fabulous evening to celebrate 50 years of Cardiff Speakers Club. Here’s to the next 50 years! Below is the advert which appeared in The Speaker (the ASC magazine) advertising the event. Stop Press – Places for this dinner are strictly limited and we anticipate that demand could exceed supply. You are therefore strongly advised to make your reservation at the earliest opportunity! 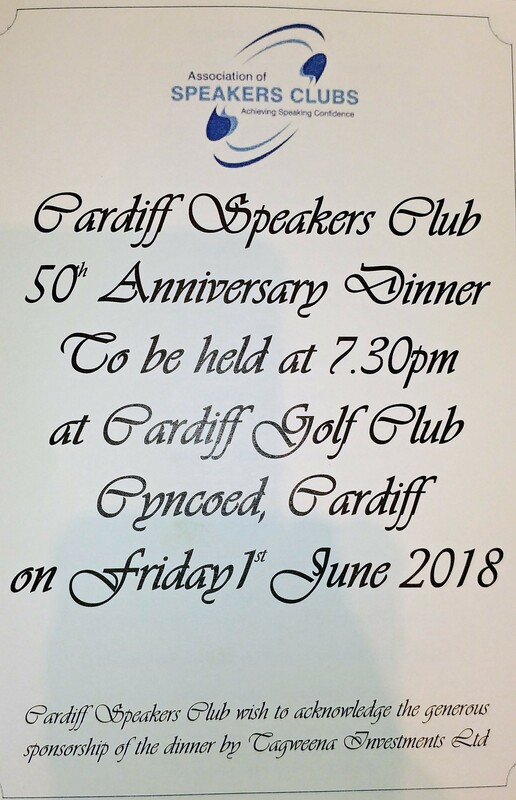 This year, 2018, Cardiff Speakers Club marks the 50th year since it was formed. To celebrate, the club is hosting a gala dinner to which members of clubs within the Association of Speakers Clubs are cordially invited to attend. Our friends from Cardiff Mixed and Newport Speakers Clubs will also be joining us for this great occasion. The celebration will take place at Cardiff Golf Club, on Friday 1st June 2018, 7pm. Ahead of the three-course dinner we will be delighted to welcome our guests with a pre-dinner drinks reception. It’s a formal occasion – dinner jackets or lounge suits for gentlemen and cocktail dresses or similar for ladies. The evening will comprise a full programme and we shall be privileged to welcome the new National President, Jackie Mafi, as our honoured guest. Our 50th anniversary gala dinner will be a wonderful opportunity to visit Cardiff and enjoy its stunning city centre, fantastic shopping facilities to rival any in Britain, and its wonderful castle, parks and civic centre. In June the whole city will be a wonderland of flowers and plants. In fact, a superb venue for a memorable weekend getaway. Cardiff has a huge selection of sensibly priced hotel accommodation close to the dinner’s venue. The cost of the dinner is just £25 and the celebrations commence at 7pm. Cardiff Golf Club is easily located and we look forward to welcoming ASC members and their wives, husbands, partners and friends.